I was born 1968 in Ulaanbaatar, Mongolia. I'm married and have two daughters. My wife's name is Enkhee. She is a teacher of mathematics of a colledge. 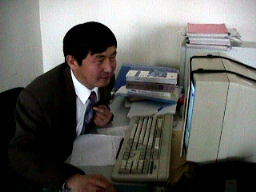 There are my careers: 1986-1991 Mongolian National University, Studied mathematics, 1991-1995 Reseacher at the International Management Institute (Ulaanbaatar), 1995-1997 Programmer, Chief Programmer at the Information Center of NIC Co. Mongolia, 1997 April completed requirements of The Executive Programme in Management at the Maastricht School of Management, Netherlands. Specialization: "Accounting Information Systems". My draughts home page! : I like to play in 10x10 square draughts. I'm national master of Mongolia. Mongolia Online: Only one ISP in Mongolia. Prime Minister Amar Street-20A, NIC Co.